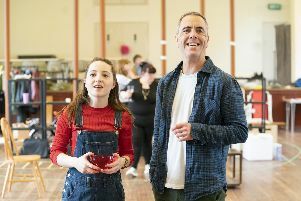 Harold Pinter’s dark and tragic comedy masterpiece The Birthday Party celebrated its 60th anniversary earlier this year and now audiences can enjoy the play at Titchfield Festival Theatre. The playwright was famous for his love of the absurd and this production will appeal to both his fans and those who are new to his subtle, brilliant writing and strong characterisations. It tells the story of Stanley, supposedly a pianist who lives in Meg and Petey’s rather seedy boarding house. Two sinister strangers – Goldberg and McCann – arrive. Stanley’s birthday party suddenly is turned into a nightmare…. TFT’s production takes us back to the seaside of the 1950s, with pipe organ songs and Punch and Judy adding a menacing touch. Daniel adds: ‘We have assembled a fantastic cast for the play. The Birthday Party is regarded as a “comedy of menace” and there is undoubtedly a dark tone which underlies it.